A moment of joy and relief: the Director-General of the ITER Organization, Osamu Motojima, and the Directors of all seven Domestic Agencies (US ITER not pictured) signing a Memorandum of Understanding for the use of a single Logistics Service Provider. 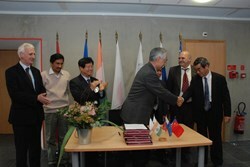 The Director-General of the ITER Organization Osamu Motojima, and the Directors of all seven Domestic Agencies this week signed a Memorandum of Understanding that provides for the use of one single "Logistics Service Provider" in order to assure the transport of all the ITER components from their manufacturing sites around the world to the ITER construction site—may this happen by road, water or air. The signing of this Memorandum is the culmination of a joint effort that started years ago involving staff from the ITER Organization and the Domestic Agencies. "It was really impressive to see this international tender evolve," the Head of the ITER Procurement Division, Francoise Flament, said after the signature. "It was a bit like a big puzzle that, looking at all the pieces spread across the table, seemed impossible to complete in the beginning. But thanks to a great collaborative spirit, the legal framework covering every aspect of the transport of ITER components—including storage, insurance, handling, and customs management—will facilitate the complex logistics of the worldwide procurement of ITER components, and enable us to ensure their safe arrival on site." In the meantime, the tender process for the Logistics Service Provider is ongoing. The offers are currently being evaluated by the ITER Organization and the Domestic Agencies in order to award the contract by May of this year.